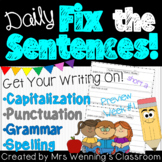 Daily Fix the Sentences (Fix Its) - Whole Year! Also included in: 2nd Grade Writing Survival Kit! Whole Year Bundle of Resources! 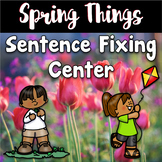 Sentence Fix – Sentence Repair Pre-Primer Edition is designed to help students become better writers and readers. Your little learners will be required to read the sentence and find all the mistakes: misspelled sight words, uppercase/lowercase letter mix-ups, and incorrect or missing punctuation. We're going on a scarecrow hunt. These cute scarecrows are programmed with th and sh digraphs. Place these around your room and watch your students delight. The kit also comes with a recording sheet and six cut apart and fix it sentences. 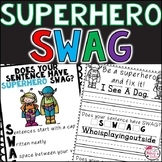 Perfect for Daily Five and Literacy Stations. Winter Write the Room is a fun literacy center that students are excited to do. 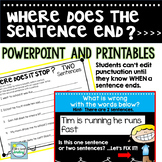 This write the room activity focuses on writing complete sentences by correcting capitalization and punctuation errors. Students will be required to find the card, read the sentence, and write the sentence correctly. 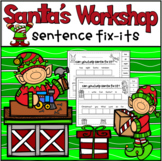 If you are looking for a fun, Christmas themed packet to provide your students with extra practice for sentence structure, grammar, capitalization, and punctuation, then look no further! 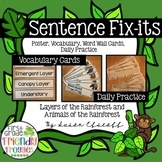 Sentence Fix Its are a fantastic way to help students develop skills needed to correctly write good sentences! This huge power point includes morning work 18 weeks of school. It includes several language arts morning work sentences to fix and to engage your students with daily practice. 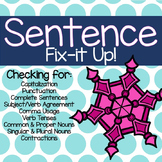 This is a bundle of 5 Sentence Fix-up activities. For these activities, children unscramble the sentences to make them make sense. I use these as literacy centers. The simple words and directions make them good for independent work.